Democrats already have a well-worn, and misleading, talking point about it: 83 percent of the tax cuts go to the wealthiest 1 percent. That’s true for 2027 but only because most of the individual income tax changes expire by then...The important missing context is that the final tax legislation, which President Donald Trump signed into law Dec. 22, allows most of its individual income tax provisions to expire by 2027, making the tax benefit distribution more lopsided for the top 1 percent than in earlier years. In 2018, according to an analysis by the Tax Policy Center, the top 1 percent of income earners would glean 20.5 percent of the tax cut benefits — a sizable chunk, but far less than the figure that’s preferred by Democrats. And in 2025, that percentage would be 25.3 percent, with the top 1 percent (those earning above $837,800) getting an average tax cut of $61,090. Just two years later, in 2027, the percentage of tax benefits to this income group jumps to 82.8 percent, “because almost all individual income tax provisions would sunset after 2025,” explains TPC. The House on Friday voted to permanently extend the individual tax cuts in President Trump’s 2017 tax law, giving House Republicans a chance to tout the law as they prepare to leave Washington to campaign. The legislation passed on a vote of 220-191. Three Democrats voted for the legislation and ten Republicans voted against it. Two of the Democrats who voted for the bill, Reps. Jacky Rosen (Nev.) and Kyrsten Sinema (Ariz.), are both running for Senate. Rep. Conor Lamb (Pa.) is in a competitive race against Rep. Keith Rothfus (R) in the newly drawn 17th District of Pennsylvania...House Republicans, with the support of Trump, want to make the tax cuts permanent both because they think it’s good policy and because they think it will benefit them politically. They see it as a way to highlight strong economic numbers and to force Democrats to go on the record about extending tax provisions that benefit middle-class taxpayers. The much-maligned top one percent paid more than 37 percent of all federal income taxes that year, which is the most recent on record for which we have data. The top three percent footed just over half of the total federal income tax bill. And those in the top five percent were responsible for paying nearly 60 cents of every federal income tax dollar collected by Uncle Sam. If you look at the black lines on the bar graph above, you will see that the federal income tax share paid by "the rich" far outpaced their respective portions of the nation's overall earnings. The bottom half of US earners -- 50 percent of the country -- paid approximately three percent of all federal income taxes in 2016, slightly less than the contributions of the top .001 percent alone. 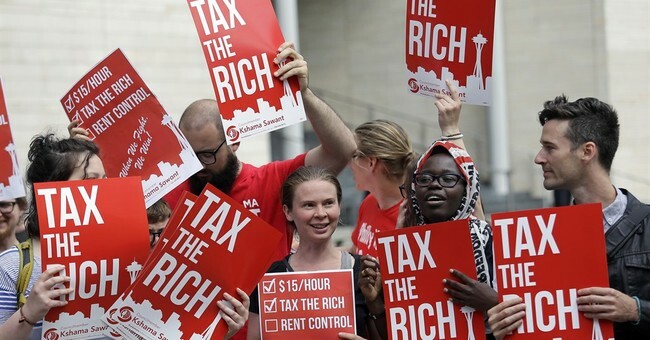 The Left's political stories about "fair shares" and "millionaires and billionaires" may pack a potent rhetorical punch in the service of fueling grievance politics and class warfare, but they're not grounded in facts and omit crucial perspective. It's worth noting that in the latest NBC/WSJ poll, the GOP holds a record-high 15 point lead over Democrats on the economy. Parting thought: How can nearly every Democratic member of the House of Representatives defend their decision to march with Nancy Pelosi against solidifying the GOP's middle class tax cuts? And before you say "deficits," I'll remind you that Democrats couldn't even be bothered to pretend to care about that issue when President Obama was racking up national debt at an unprecedented rate, demagoguing Republican policy prescriptions along the way. I'll also remind you that we have a federal spending problem, not a revenue problem.